When Eurie, Marion, Ruth and Flossy embarked on their journey to Chautauqua in August, 1875 they traveled by railroad to Mayville. From there they took a steamer to Chautauqua. The map below shows the towns that lined Chautauqua Lake in 1906 (several years after the girls first journeyed there). You can see Mayville on the far left side of the map (click on the map to see a larger version). In Mayville, the girls boarded a steamer named, The Colonel Phillips, and boated along the southern shore of the lake to Chautauqua. As luck would have it, they arrived at Chautauqua under less than perfect conditions: it was raining and well past dark when they reached their destination. 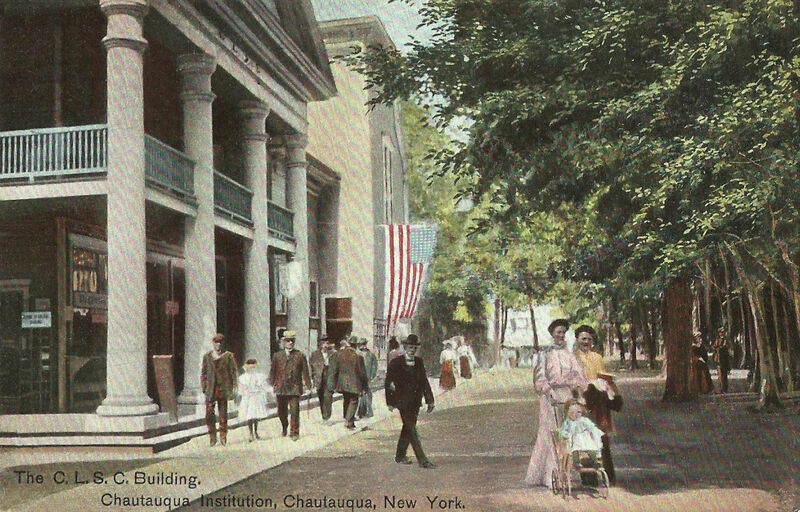 From the deck of The Colonel Philips, their first glimpse of the institute was probably the Chautauqua Institution dock, which stood at the tip of a point that jutted out into the lake. Incoming steamboats used the dock to let passengers on and off. The vintage postcard below shows the steamer, City of Cincinnati, docking at Chautauqua after dark, in much the same way as The Colonel Phillips would have docked (click on any of the images below to see a larger version). In 191 1 the Miller Bell Tower was erected alongside the dock. It was built to commemorate the life and contributions of Chautauqua co-founder Lewis Miller. When the girls returned in 1913 (as described in Isabella Alden’s book, Four Mothers at Chautauqua), they would have seen the beautiful new bell tower as they approached the dock; and they would pass it as they stepped off the boat and entered the Institute grounds. The hand-colored postcard below shows the tower and dock looking northeast toward the direction from which the girls’ steamer would have arrived from Mayville. 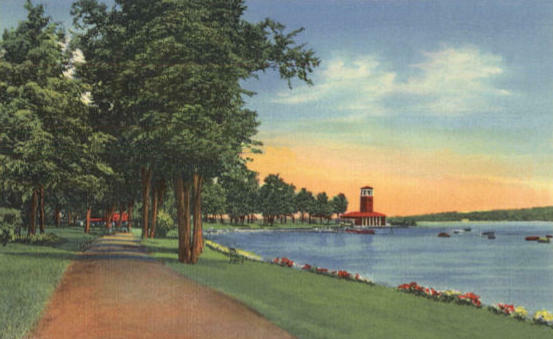 The postcard also shows South Lake Drive, which ran along the shore from the bell tower to the south end of the Institute grounds. From the vantage point presented in this picture, the Chautauqua Auditorium was just out of view to the left. 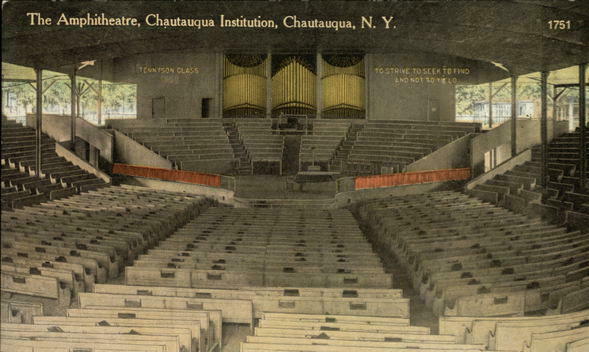 For the benefit of such poor benighted beings as have never seen Chautauqua, let me explain that the auditorium was the great temple where the congregation assembled for united service. Such a grand temple as it was! The pillars thereof were great solemn trees, with their green leaves arching overhead in festoons of beauty. I don’t know how many seats there were, nor how many could be accommodated at the auditorium. Eurie set out to walk up and down the long aisles one day and count the seats, but she found that which so arrested her attention before she was half-way down the central aisle that she forgot all about it, and there was never any time afterward for that work. I mean to tell you about that day when I get to it. The grandstand was down here in front of all these seats, spacious and convenient, the pillars thereof festooned with flags from many nations. The large piano occupied a central point; the speaker’s desk at its feet, in the central of the stand; the reporters’ tables and chairs just below. The Auditorium was used for the first four years, then the Amphitheatre—a more permanent, open-air structure—was erected that could hold many more people. The Amphitheatre’s crowning glory was its magnificent pipe organ. 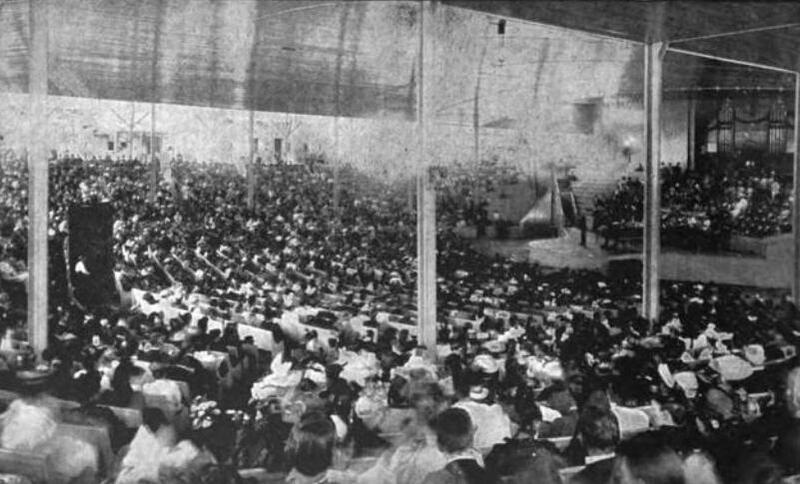 The seats behind the Amphitheatre stage were typically occupied by speakers, performers, choirs and orchestras. The photo below from about 1895 shows The Amphitheatre in service, with every possible seat taken. The view looks across The Amphitheatre, with the stage and speakers on the right. You can just make out the shape of the huge organ pipes. 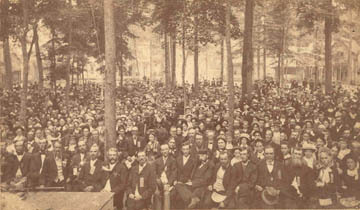 After the girls attended their first lecture in the Chautauqua Auditorium, they decided to stay on the grounds, rather than at a nearby hotel. They appealed to the Institute President to help them find a suitable place to stay. 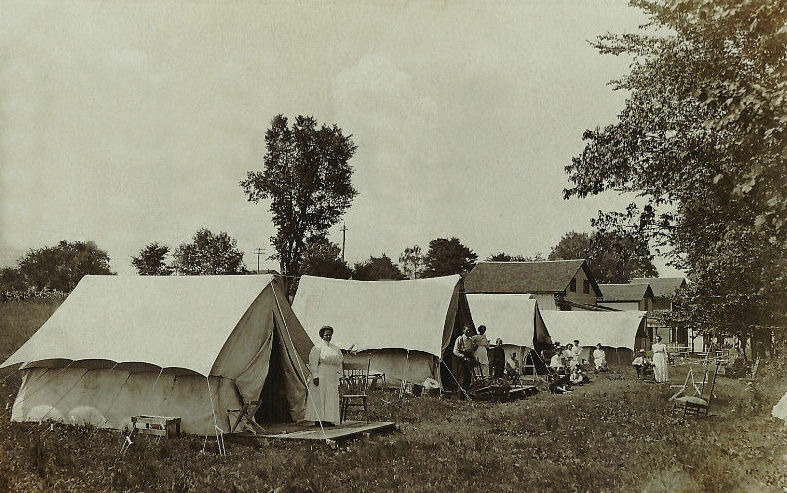 As he showed them the available tents to rent, Ruth couldn’t hide her dismay. 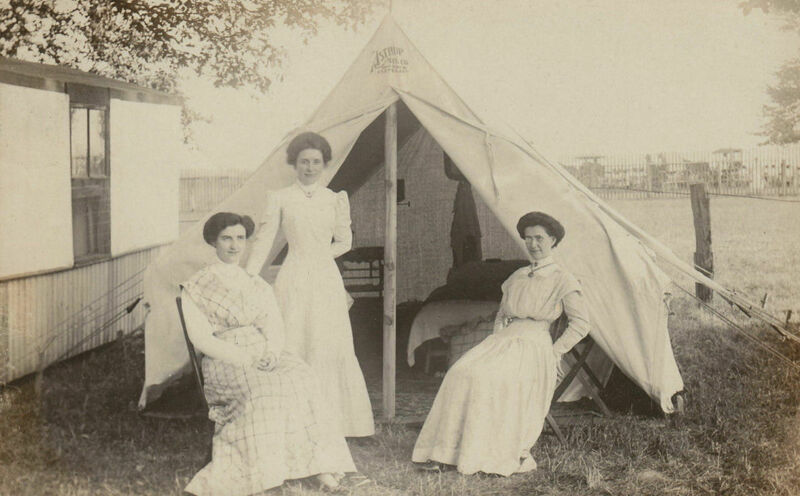 Ladies camping in a typical Chautauqua tent in 1908. “And are all four of us expected to occupy this one room?” There was an expression of decided disgust on Miss Erskine’s face. 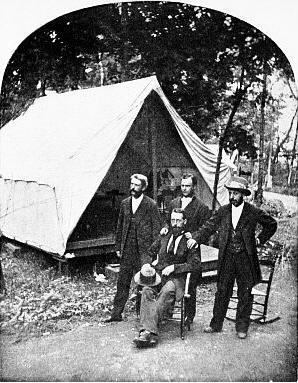 Chautauqua Speakers in front of their tent in 1875. J. L. Hurlbut, J. A. Worden, Frank Beard (famous for his “chalk talk”), and J. L. Hughes. Another voice chimed in now, which was the very embodiment of refined horror. “And you don’t have pianos nor sofas, and the room isn’t lighted with gas! I’m sure I don’t see how we can live! It is not what we have been accustomed to.” This was Marion, with the most dancing eyes in the world, and the President completed the scene by laughing outright. Suddenly Ruth discovered that she was acting the part of a simpleton, and with flushed face she turned from them, and walked to a vacant seat, in the opposite direction from where they were standing. By a violent effort and rare good sense Ruth controlled herself sufficiently to laugh, and the embarrassment vanished. There were splendid points about this girl’s character, not the least among them being the ability to laugh at a joke that had been turned toward herself. The girls survived their first night in the tent. The next day, they split up, each going in different directions; and Flossy soon found herself lost and alone on the grounds. Meantime Flossy was being educated. The morning work had touched her from a different standpoint. She had not heard Dr. Walden; instead she had wandered into a bit of holy ground. She began by losing her way. It is one of the easiest things to do at Chautauqua. The avenues cross and recross in an altogether bewildering manner to one not accustomed to newly laid-out cities; and just when one imagines himself at the goal for which he started, lo! There is woods, and nothing else anywhere. Another attempt patiently followed for an hour has the exasperating effect of bringing him to the very point from which he started. Such an experience had Flossy, when by reason of her loitering propensities she became detached from her party, and tried to find her own way to the stand. A whole hour of wandering, then a turn into perfect chaos. She had no more idea where she was than if she had been in the by-ways of London. Clearly she must inquire the way. 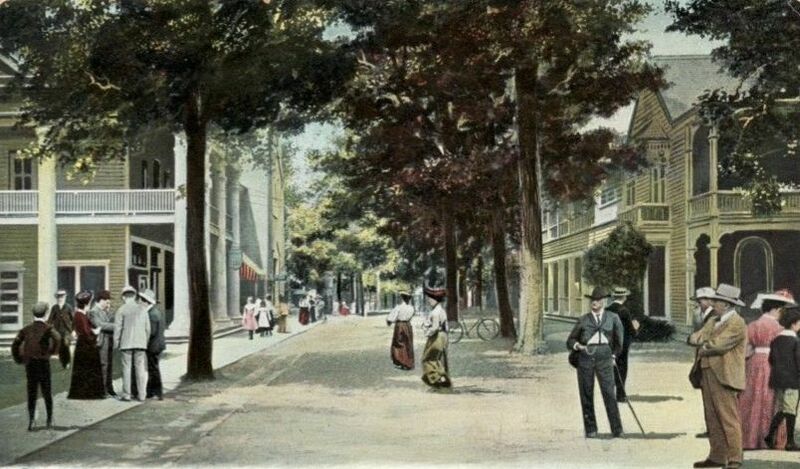 While trying to find her way, Flossy may have walked down Clark Street, which is pictured below in 1907, looking south from Miller Avenue (named after Lewis Miller). The Chautauqua Literary and Scientific Circle (C.L.S.C.) building is on the left. 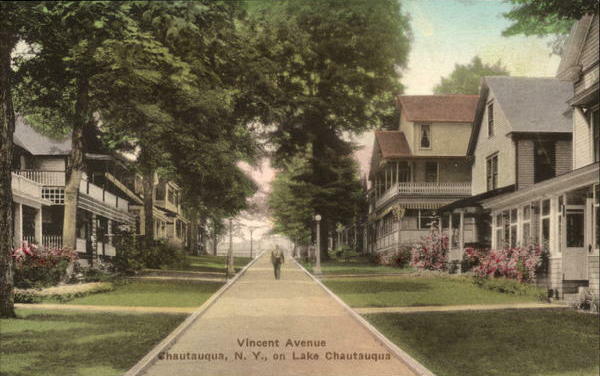 And below is a photo of Vincent Avenue, named for Methodist Bishop John Heyl Vincent, one of the founders of the Chautauqua Institute. The photo was taken in 1930, long after the girls’ first visit. Little did Flossy, Ruth, Eurie and Marion know that those first days in Chautauqua were the prelude to life changing experiences for each of them! The black and white photo of the Ampitheater and organ was taken prior to 1907 as it shows the original pipe organ (far right of photo) before the Massey Memorial was installed. Fred, you’re right! The photo was taken about 1895 and was mislabeled in the post. It’s corrected now. Thank you for catching the error!